Summer is here, and the weather is nice and hot. You are eager to have a fun time, but need some ideas on what to do? We are here to help you with some unique activities to get you out of your typical and ordinary routine. Have you been to the Santa Ynez valley before? Whether this is your first time or not, there is always something fun and new to do around Santa Barbara wine country. – Wine Tasting Tour in SB Wine Country – We, at Silk Road Transportation, can show you a great time. We know the area well and we have access to some hidden gems not open to the public. We can help you plan a memorable day in the valley. Private or group tours, we can accommodate any request. – Brewery Tour in Santa Ynez Valley – The Santa Ynez Valley is home not only to great wineries but also to some great brewery. We have well known breweries such as Firestone and Figueroa Mountain and we at Silk Road Transportation can get you in and tasting some special and unique beers. – The Santa Ynez Valley is also home to a great Distillery. Add some sparkle to you day and taste some amazing hot drinks! – Not into the day activities? 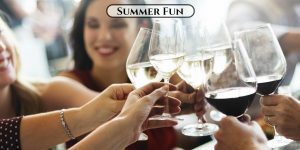 How about going out in style in a limousine for dinner or a drink in the town to celebrate summer? Silk Road Transportation offers night out transportation with a variety of vehicles to choose from for your convenience and comfort. We take care of everything so you can arrive in style and enjoy your night! Any day is a good day for a good celebration, and we are available on any day at any time! Let us help plan your summer fun. Call Silk Road Transportation at 1(805)403-3300 to take you there!